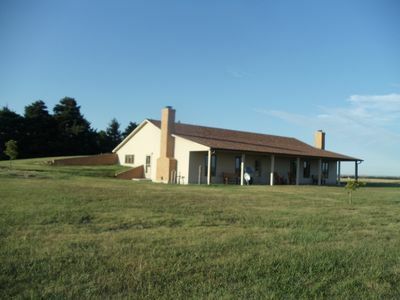 The entire 500 square foot cabin, just outside of Abilene, KS, is here for you to enjoy! 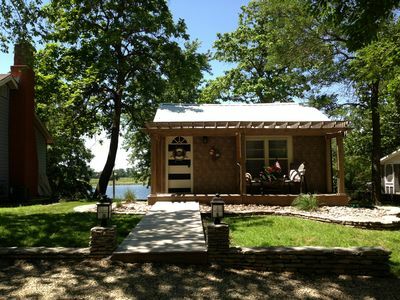 Located on Red Bud Lake, a small private seven acre lake, it is one of several homes located on the lake. A feeling of coziness and charm will greet you as you enter the studio-type cabin. A mix of woodsy decor and a touch of nautical, give this space what one of our guests called, "a Pottery Barn" feel. You will sleep comfortably on the newly installed murphy bed, complete with queen size 10" memory foam (Gel Lux) mattress, sheets, pillows, and comforter. It looks like a cabinet in the living room area, and is easy to pull down for sleeping and back up during the day. A sofa sleeper with queen size mattress is also available, as well as an inflatable floor mattress. Enjoy over 100 channels of Direct T.V. and Hughesnet internet service. There is also a DVD player if you want to rent or bring your own movies. We've stocked the cabinet with a few board games and cards. The kitchen is equipped with a stove, refrigerator, microwave, Keurig coffee maker, and toaster. The drawers are stocked with flatware and utensils, paper plates, cups, pans, bowls, etc. In the dining area, the table has a picture window with a view looking out to the lake. There is also an iron and ironing board for your convenience. The bathroom is fully stocked with fresh towels, washcloths, and a hairdryer. There are also toiletries available, such as shampoo, shower gel, etc. Outside, enjoy the screened-in porch, the deck, and dock. Whether you are enjoying a cup of morning coffee on the porch or an evening drink while sitting in one of the adirondack chairs, this will be a favorite place. On the kitchen island you will see a guidebook with several eating and sightseeing suggestions in Abilene. (The cabin is just west of town, about 5 minutes.) For more dining or shopping options, Salina is located about 25 minutes to the west and Manhattan is about 45 minutes to the east. We are located 3 miles off of I-70 exit 272. (Talmage/Fair Road Exit) The cabin can be easily accessed from Old 40 Highway, also. The cabin is perfect for a couple's getaway or a girls' weekend, but can also accommodate a small family. While at the cabin, feel free to walk around the lake or through the trails at the north end of the lake. Note: At the entrance, the sign says, "Members Only." That is to indicate that this is a private (not public) lake. However, as our "renters," you are completely welcome on the property. The home-owners association has given us permission and support to use our cabin as a short-term rental.